Energy prices have been over-inflated since oil passed the $80 a barrel level, triggering a world-wide rush to develop alternative fuels and energy sources. 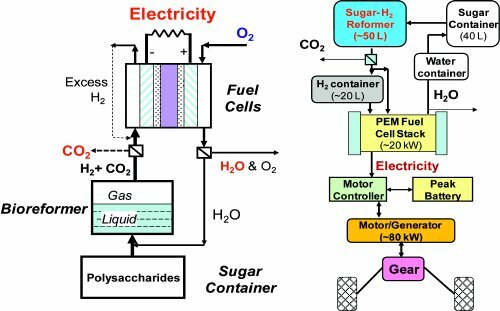 One of the interesting ideas for new energy is the sugar fuel cell, where cheap sugars from biomass sources would power fuel cells of all sizes for a wide range of applications from hand-held consumer products to utility-scale power backup and load leveling. Here we suggest an out-of-the-box solution - use of renewable biomass carbohydrates as a high-density hydrogen carrier. This new solution can efficiently address the above challenges for the transportation sector. Here we present the recent advances in cell-free synthetic pathway biotransformation (SyPaB), the roadmap of SyPaB from high-end to low-end applications, and its potential impacts. Cellulosic biomass is the most abundant renewable biological resource (ca. 1 x 1011 tons/year)3. Biomass is produced locally, and is more evenly distributed than are fossil fuels. Each year, the overall chemical energy stored in biomass by terrestrial plants is approximately 6-7 times the total human energy consumption. Also, renewable carbohydrates (e.g., cellulosic materials and starch) are less expensive based on energy content than are other hydrogen carriers, such as hydrocarbons, biodiesel, methanol, ethanol, and ammonia1. The use of a small fraction of low-cost renewable biomass for producing transportation fuels (e.g., cellulosic ethanol and hydrogen) provides benefits to the environment, economy, and national security3. Follow the link to the full article, with illustrations, links, and more detailed explanations and arguments. Australian company Linc Energy is promoting its underground coal gasification and gas to liquids technology in the land down under. In situ underground coal gasification is suitable for difficult to mine coal of even the lowest quality. Syngas to liquids technologies are becoming more economical with better catalysts and process designs. Offshore and other small-scale gas to liquids (GTL) is getting closer to feasibility, thanks to microchannel architecture reactors. Powerful members of the US House of Representatives are beginning to push back against President Obama's policies of energy starvation. Besides promoting increase US offshore oil & gas production, congress is likely to promote coal to liquids and increased development of oil shales, heavy oils, and oil sands. Advanced nations have multi-trillion dollar infrastructures devoted to mainly liquid fuels (and secondarily gaseous fuels). But if sugar fuel cells truly can provide a disruptive fast track technology to multi-scale, decentralised production of electrical power, then solid fuels may join the club. The more the merrier. If Obama's Nuclear Regulatory Commission ever wakes up and realises that it has an important job to do besides preening before the mirror, nuclear power may begin to fulfill its immense promise as well.